“Tis the season for holiday upkeep! During these busy times, there’s so much to do to stay organized and minimize the stress this time of year can create. Here are some tips to help you stay organized. Shopping, hosting dinners and attending parties will have you driving a bit more than usual. Quick, regular cleaning will keep your car neat and germ free. You probably just spent the Fall getting your home in order, but there are some other things you can do to get ready for guests during the holidays. It can be such a hectic time, so having a plan will be helpful. Follow the path of your guests. Your entryway will be the first thing people see, so make sure it’s neat and welcoming. Guests will naturally gather in the kitchen, so maintain visible surfaces like the floor, counters, and the sink. Give the bathroom some love by lighting a candle, emptying trash, and having fresh hand towels and extra toilet paper visible. Make the bedrooms comfortable by making the beds with clean sheets and leaving fresh towels available for showering. Have carpets and upholstery deep cleaned to remove any stains from things like wine and cranberry sauce. Replace your vacuum cleaner bag – all sorts of germs, bacteria and yes, bugs can survive in there. Deep clean your oven and stovetop. Be sure to follow the manufacturer’s instructions. Sanitize your bathroom by cleaning the base of the toilet and cleaning all handles and faucets with disinfectant cleaner. Freshen the bedrooms by changing the sheets, washing mattress covers and protectors, and vacuuming the mattresses with an upholstery attachment. 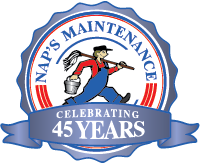 And, for the person on your gift list who has everything, or someone who could really use services to take care of these tasks, a NAPs Maintenance gift certificate is the perfect gift. Coming in all denominations, they can ease someone’s holiday stress. Contact NAPs to purchase your gift certificates today! If you need to delegate these tasks so you can focus on enjoying this time with family, NAPS Maintenance is a full service company that offers a variety of in house and off site services to help you maintain just about everything in your life.